Need a long term, cost effective dust control solution? Simply level out ruts and potholes one last time…lay TRUEGRID® PRO PLUS and infill with stone. 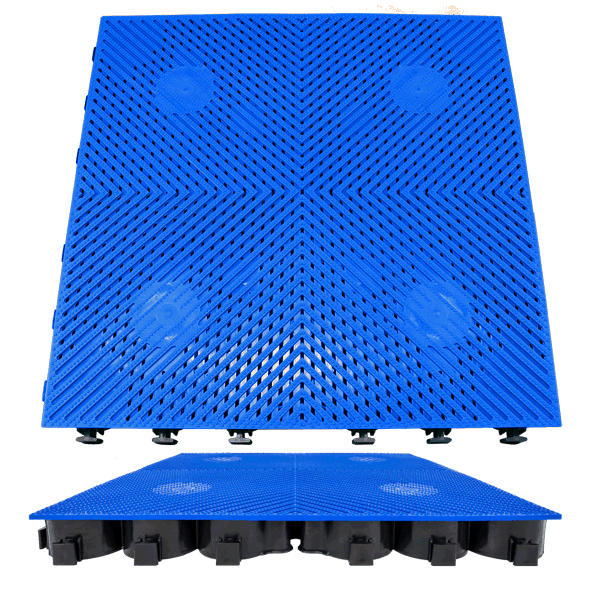 TRUEGRID prevents gravel pulverization and stops dust. Yes: drive on TRUEGRID with any equipment with no ruts. Yes: water drains through TRUEGRID pavers. No mud! Stop risking fines, employees’ health and frequent, recurring maintenance expense. Conventional gravel-only lots and roadways create large amounts of choking, blinding air-borne dust. That’s in dry weather. In wet weather, you fight mud, ruts and work stoppages. TRUEGRID is the easy-to-install solution to dust and mud. Simply level your truckyard, lot or roadway, lay interlocking TRUEGRID pavers and fill with hard, angular aggregate. Don’t overfill, let the grid do the work. The payback is quick and your headache goes away. Permanently. The patented TRUEGRID system is strong enough for industrial lots and heavy equipment yards with heavy traffic flow and daily use. PRO PLUS is H20/HS20 rated and can handle 260,000 lb. cranes, fork-trucks, 18 wheelers. No need to continue to spray water or chemical dust suppressors. TRUEGRID is the one-time solution for strength, durability and dust control. TRUEGRID® PRO PLUS® is 100% permeable. Gravel is contained, stabilized and prevented from migration or pulverization. No more air-borne dust or gravel refilling. No more potholes. PRO PLUS drains instantly when filled with clean aggregate. Drive on the stabilized surface, drain and detain stormwater below. Bonus- use TRUEGRID SuperSpot® parking and traffic markers to stripe and better utilize your space. TRUEGRID® permeable pavers can also be filled with gravel for a strong, unlimited traffic surface. 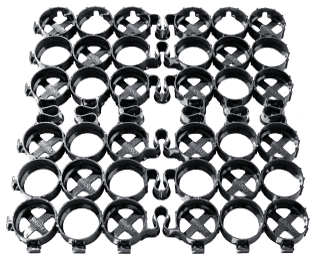 TRUEGRID® can drain water up to 800 inches per hour and can remain open and usable even after the heaviest downpour. TRUEGRID® prevents the gravel from rutting, washboarding, and eroding -- saving your maintenance crew hours in repair time. Your options are: gravel-only, concrete, asphalt or TRUEGRID. Here’s why TRUEGRID wins. Concrete is expensive. Asphalt doesn’t hold up. Gravel-only is a constant dust and repair problem, and continuing expense. All three - gravel-only, asphalt and concrete - are coded as impervious. In many cases, adding concrete or asphalt may result in the need for a detention pond or added drainage elements. TRUEGRID is the one-time solution that is less expensive than concrete, more durable than asphalt and eliminates gravel-only dust, mud maintenance problems. TRUEGRID can be striped for better utilization than gravel-only. TRUEGRID requires no added drainage or detention and the only solution that offers 100% land use. Proven in millions of square feet of industrial and commercial installations across the USA. A developer had plans to build an overnight parking location for 18 wheelers on major truck line in West Texas. The site was 5 1/2 acres and a 35,000-square-foot and 4-foot-deep detention pond was required along with a major additional drainage element to handle and route stormwater runoff. Due to being a quite flat land with little slope, expensive sump pumps would have been required as well. Projected costs for both asphalt and concrete exceeded the targeted budget and an alternative was needed.